Kalashtami Day Special Ritual Kala Bhairava Homam - Control Time! 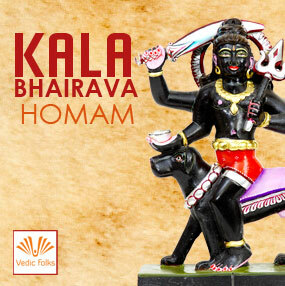 In this special Day of Kalashtami, VEDICFOLKS going to perform Kala Bhairava Homam. We Invite you all to contribute and participate in this VEDICFOLKS Special Occasion for getting favour from KALA BHAIRAVA (LORD SHIVA) the "God of Time". Program Agenda: Prathana, Ganesha Puja, Doopam Deepam Neyvetyam, Karpoora Aarthi/Deeparathana, Mantra Pushpham for Ganesha, Sankalpa to Ejamanars/Sponsors, Yadhasthanam, Kalasa Avahanams, Archana for Avahana Devadas, Doopam Deepam Neyvetyam Deeparathana, Rudram, Chamakam, Purusa Suktham, Narayana Suktham, Durga Suktham, Sri Suktham, Bhakya Suktham, Shanthi Panchakam, Pavamana Suktham, Ayusha Suktham, Kala Bhairava (Moola mantra Japa), Agni Invocation, Ganesha Homam, Parivara Devada Homam, Kala bhairava Homam, Doopam Deepam Neyvetyam Deeparathana, Namaskaram, Maha Purna Huthi, Kalasa Deeparathana/Maha Deeparathana, Mantra Pushpam, Yadhasthanam, Kalasa Purochanam/Holy Water, Maha Prasadams, Final Namaskaram Process/Blessings from Bramanas. 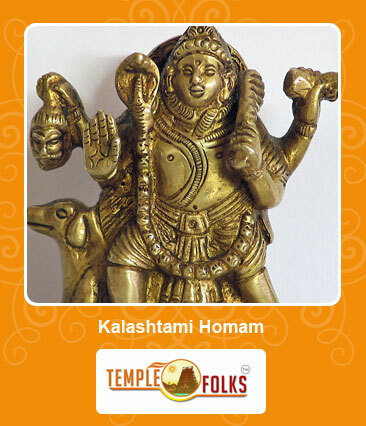 Why Kala Bhairava Homam on the occasion of Kalashtami? Kala signifies "time" and "Bhairava" the appearance of Shiva. Performing Kala Bhairava Homam on this auspicious day favors us with time administration abilities, protects us against mischance's and other unforeseen occasions, brings us sure vitality and achievement, eases us from obligations and enhances our budgetary status and frees our negative Karma. - Complete protection against dangerous things. - Reduce malefic effects of planets in a horoscope to overcome misfortunes in life. - Highly recommended for Workers, Entrepreneur, Business Peoples to avoid mistakes and wrong doings. - In this auspicious day, Goddess Kali is additionally adored alongside Lord Kala Bhairava. This Homam helps in attaining peace and amicability in life. - One can get relief from assorted types of obstacles in life by performing the Kala Bhairava Homam. The malefic impact of planets is additionally wiped out. - The individual who performs this Kala Bhairava Homam gets free from all his wrongdoings, apprehensions, and sufferings. - Finally, Kala Bhairava Homam evacuates the dreads, sins, and various sorts of malefic impact of the planets from the life of a single person.